I find that the weather heavily influences what I want to be sipping on. In the previous weeks with the sun shining I’ve reached for Riesling and Rosé. 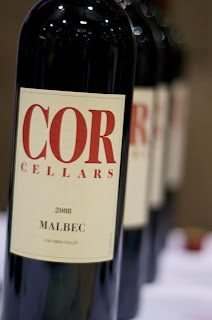 The other day I tasted Cor Cellars 2008 Malbec and it couldn’t have gone better with this Seattle... um... summer? This wine is deep in color, it smells big and intense yet is sophisticated and varietally expressive. It feels rich and round on the palate, the oak is very-well integrated and the Malbec punches through with flavors of blackberries, the ripest of plums, coffee and chocolate but maintains a bright flavor reminiscent of apple cider. This is an exciting wine that shows us what Malbec is about in Washington. Meaning, it doesn’t have to be masked by oak, it can actually marry it and be quite happy. Cor Cellars was founded by Luke Bradford in 2005. He worked and learned in Tuscany and Sicily before returning to WA to further his hand at some NW Wineries including the much-loved Syncline Wine Cellars. He has planted some of his own vineyards both in Horse Heaven Hills and in the Columbia Gorge. He buys some fruit also. Cor is located in Lyle, WA down by the Gorge and currently has five wines available. They have a great and information-filled website so check it out. This Malbec hails from Hogsback Ridge & Alder Ridge Vineyards. It spent 20 months in barrel and most importantly, it’s quite delicious. So stay warm and find this bottle o’ goodness. In Seattle it is available at Soul Wine, some PCCs, McCarthy & Shiering. In Oregon you can find it at Wine Sellers Hood River, Gorge White House, just to name a few.